Structure, and especially the different ways one experiences it is something I've been thinking about a lot recently. For me, the structure of both my life, and body changed in 2010. However, these have been structural changes for the better. One way to address this idea was to create a follow up to my original 'scoliodress' that can be seen here. I wanted to make another representation of my spine after surgery (with the curvature now at a mere 23 degrees), this time with all its added metal work and screws. These images were taken by my good friend Flo - a very talented photographer who is currently applying to study it at University. We'd planned for a while to do a shoot this weekend, but my approach to time management is sometimes a little haphazard and thus, I didn't start making the dress until about nine pm last night, and subsequently had to get up at seven-thirty this morning to finish it off! However, the tedious hand sewing of the 'rods' paid off when I tried it on for the first time. The construction of this dress was a little trickier than the last, as I had to devise a way to portray my x-ray without using actual strips of metal. The answer was found in some silver electrical cable from something my little brother had taken apart. I then decided the easiest thing to show screws would be, well... screws. The dress was back to front as I didn't want a zip to mess up the line of the vertebrae,which were made of raw silk like before. I also pinned darts along the waist to shape it. Visually, I styled it with several of the items used the first time round - to make the contrast between the spine shape of the 'before' dress and 'after' dress markedly different. 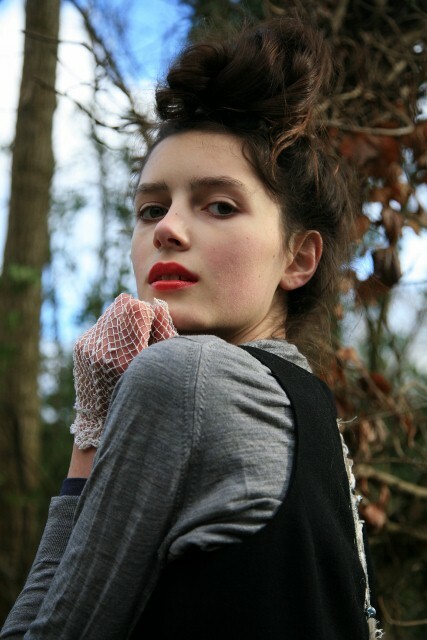 So it was on with the same beloved vintage Jaeger jumper, and the same vintage silk scarf in my hair. However, this time I used cable knit tights (from Next), a pair of charity shopped Betty Jackson shoes - so the silver matched the 'metal work' - and net gloves that belonged to my great-grandma. It felt odd going through the motions of creating another 'scoliodress' again - almost akin to deja vu, but with some obvious changes. However, while sitting at the sewing machine, trying to get it to cooperate and to not ruckle up the silk, I had a sudden memory of what it felt like in early Autumn to be making the first dress, having no idea of what lay ahead. In retrospect, I'm glad I didn't know how much pain I would be in or how hard it would be to be incapacitated for a while post-surgery. The first dress was fired by fear of the unknown and a desire to turn my helpless situation into something creative. This second dress was driven by experience. This post is a little briefer than usual, but Sunday evening-itis and a mound of homework are overwhelming me. However, I couldn't wait to share these images, and I'm very grateful to gorgeous Flo for taking them. Thanks for sharing the post. Lovely! Unbelievably talented and original handiwork! I love how you interpret real life into fashion! Love this!! So cool to see the difference in your spine! These are really lovely photos and I love how you've styled your hair! Yay! 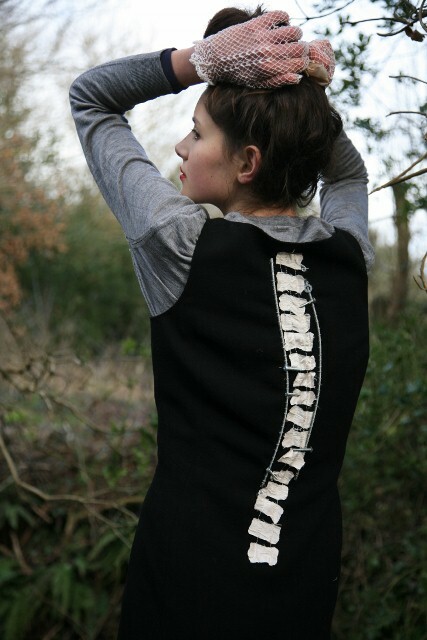 A dress with your fixed spine! :D I'm so happy for you! And I also want to thank you for having come to say hi. Your good wishes meant a lot to me! I want you to know that I think a lot about you and wonder how you're feeling now. Your story touched me a lot and I admire your strength and will. You'll definitely achieve everything you want ;). I'm glad you did another scolio dress! I was hoping you would. these photos are beautiful! I love the hair!! I loved your scoliodress and thought it was so creative, it is a fantastic idea to create a dress of the new you with your new spine. I'm really glad the operation worked and that you have recovered. Oooh woow really nice dress!! and cool pics!! Hope you find them interesting! Wow! Love how much thought and creativity you put in this dress. The screws and stuff remind of Frida Kahlo's paintings. The photos are great! The photographer must be very talented =) I'm impressed. Your first scoliosis dress has haunted me so I'm so glad to see this one with your lovely spine roughly where it should be. The screws are an amazing touch. You are a brave soul to tackle this process so directly. And you look quite beautiful in hardware, both inside and out. Ohh and I want your shoes!! All the best for all your future endeavors & experiences!!! Amazing concept; it turned out great and the pieces you paired it with look great. And those shoes are gorgeous. Sometimes brief is better. You said exactly what you wanted, and that is enough. You represent all the things I believe in, and came to find later in life. You are fortunate to have reached such a wisdom at an early age. Roz, you look lovely, so different with your hair up. I really love the height in the first shot with the super tall trees and your height. I can't believe I missed your last post, where did that appear from? The fog adds such a wonderful mysteriousness to it and oh, what a beautiful dress, it reminds me of the one from the Erdem collection. Thanks for your email, it's so great to hear from you again. Have a great week back at school. The photos are great and I am more than in love with the dress! Roz you are so talented to be able to create a dress like that! A really nice idea i think to contrast to your before-op dress. Hope you are feeling much, much better, looking forward to more posts! Wow Roz! I loved the original Scoliodress, but this one is even cooler! The addition of the screws and rods is interesting, I adore your creativity. 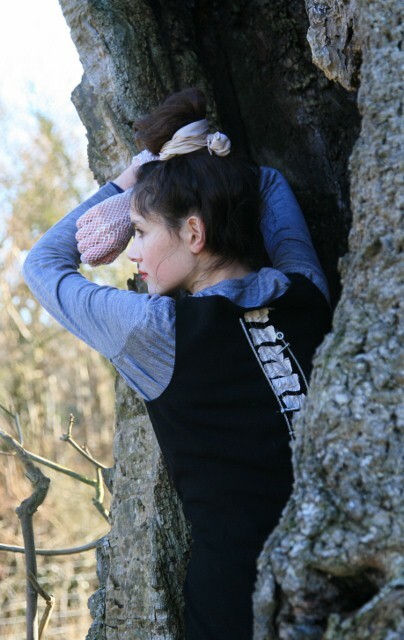 Nice shoots!I love your bun and the bone details on your back, so amazing! You have a very long legs, envy them! what a great blog...just found you today I am def a new follower! I seriously love that you do this. You are my hero. It must have felt great to make the second dress. I'm sure the experience made you stronger. Standing with the trees was a great idea. The third photo is lovely. It's like your face grabbed the light from the sun. The dress is fantastic! It is amazing what beautiful things you can create out of something that can be so scary and even life-threatening. You have made a real life, tangible symbol out of your scoliosis, and it really makes me smile. Your creativity and strength are so inspiring, I cannot say it enough Roz! This outfit is amazing and you are gorgeous! Glad I found your blog! You really are very creative and very talented! Your hair and gloves are just darling. Very unique with out being too over-the-top. I have an apron almost identical to the one in your header. Small world! Beautiful photos, dress and sense of humor. Beautiful photos and a great dress. I just discovered this and admire your sense of fortitude and sense of humor, it serves you well and will continue to do so, I'm sure. I had scoliosis surgery when I was 16 which was many decades ago, when it was a much more primitive thing. Good luck! You're beautiful, I love this outfit!It's a great ix of several pieces. How did I not see this until now? You are amazing, Roz, and this is the most beautiful visual proof of what I feel is the core of any true happiness, or peace: acceptance. It is what it is. We are all unique, and we each have our own unique challenges in life. It's how we cope with these challenges that determines our character. I don't know if I've ever seen a human being possess the courage, dignity, and grace the way you do, Rosalind. At any age. Just found your blog! I'm in love. That dress is fabulous!